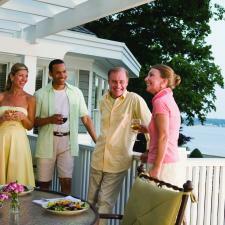 Untreated hearing loss often leads to social withdrawal. People with untreated hearing loss say they avoid social settings, because it's exhausting trying to concentrate on what people are saying, they fear answering incorrectly, or they fear looking out of touch when they can't understand the conversation. Hearing aids can help these social anxieties. Advances in hearing aid technology, like Speech Guard in Oticon's Chili, make it easier to hear in social settings thus making listening and responding to conversations more comfortable and relieving social anxiety. A recent global study done by Hear-the-World called Hearing is Living compared the lifestyle, emotional, and physical health of those with hearing loss who use and those who don't use hearing aids. The results are helping to dispel that long held myth that hearing aids make you look and act older. According to the Hearing is Living study people who wear hearing aids are more active and social than those who do not. The study showed the majority (83 percent) of hearing aid users in the U.S. agreed their quality of life improved with better hearing, but people without hearing aids were more likely to feel insecure and anxious. In part, that's because people with untreated hearing loss tend to withdraw from social situations and other interactions that increase happiness. When the ability to communicate is returned through hearing aids, many times a sense of hearing fitness and openness to the world is also returned. With facts like these, why are some people still holding back from correcting their hearing loss? Myths about hearing aids keep people from facing their fears and living a more engaged and happier life. Past stereotypes of people with hearing loss and those who wear hearing aids as being old and out of touch means some people shy, almost spasmodically, away from dealing with their hearing loss. The irony is that the stereotypes are not true. People who deal with their hearing loss are shown to feel and act younger and are seen as more in touch. They have less problems understanding conversations, are more relaxed and less anxious in social settings, and because today’s hearing aids are so small, they are rarely spotted. It is much more conspicuous to people when someone with hearing loss is anxiously denying their condition or asking to have things repeated rather than wearing a hearing aid. Many times someone with hearing loss will also nod or smile or pretend to understand in the hopes that they will fool people, but this is never the case. The only person they are fooling is themselves. So decide to live a more active and adventurous lifestyle. Invest in yourself. Invest in your hearing health. See your audiologist and get back the kind of life and happiness you deserve!